There is a special event and story in the New Years Eve midnight steam whistle blow at Pratt Institute, deemed an event that matters by the prestigious Municipal Art Society . This year may be the last year of the New Years steam whistle event. Event is at 200 Willoughby Avenue in Fort Greene. Brooklyn, NY. 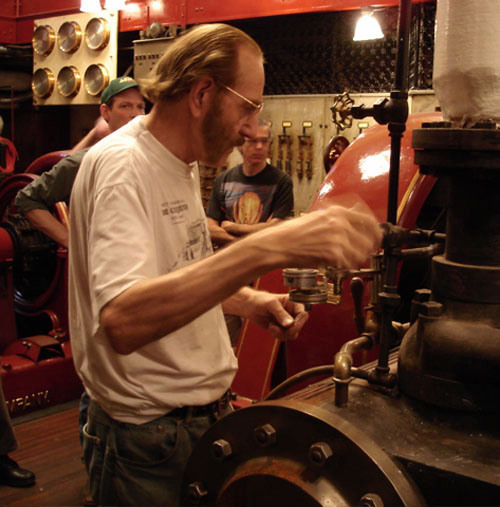 The New Years steam whistle event is a gift to Pratt and the larger world by Conrad Milster, the septagenarian Chief Engineer of Pratt Institute's Power Plant and one of USA's leading experts on steam. Conrad has connected his collection of steamship whistles and his calliope to Pratt's steam system as a New Year's Eve event for over 30 years. The event is popular with Pratt's students and is on the A-list of underground NYC events. Conrad is a beloved by Pratt students and industrial archeologists for preserving the handsome Victorian power plant at Pratt, which when allowed by the institution, he turns into a teaching tool. Conrad's love of cats, he has rescued dozens, is also legion; and the cats can be seen blissfully dozing in the heat of the plant. Conrad has traveled the world documenting in photo, video and sound steamships, locomotives and engines and often lectures on the subject. PortSide NewYork has had Conrad Milster give a talk and we look forward to doing so again. In the estimation of PortSide NewYork, if Conrad Milster were in Japan, he would surely be deemed a Living National Treasure, a designation we Americans sadly do not have. "In 1950, the Government of Japan began to designate certain individuals or groups who embodied intangible national cultural values as living human treasures, just as places or things of great cultural value are designated as national treasures, thus becoming eligible for special protection and support." from http://en.wikipedia.org/wiki/Living_National_Treasure. Not to mention that he's a generous and kind soul always willing to share his knowledge which he does with verve, warmth and a wry sense of humor.